The word Bidens means two-toothed, which describes the needle-like seeds that flowers in this family produce in enormous amounts. If you walk through a patch of Bidens that have gone to seed you come out looking and feeling that you were attacked by an army of little black needles, and good luck getting them out of your clothes. 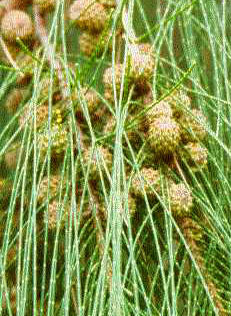 The “hitchhiker” seeds are easily spread by people, animals, wind and water, so it grows everywhere and anywhere, and once established, it is hard to get rid of. But, if you love bees and butterflies, you need to learn to love Bidens Alba. While not a neat and tidy plant, it is can be very showy at its peak. 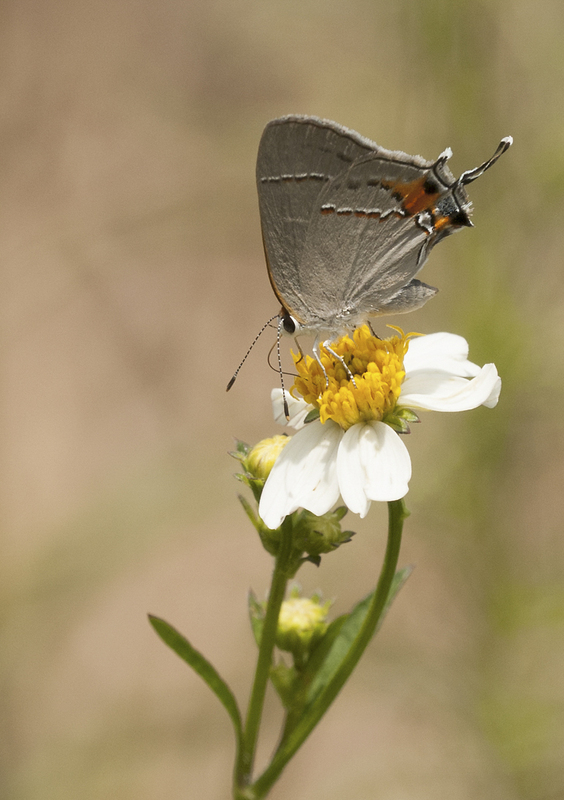 The pretty white and yellow daisy-like flowers bloom throughout spring, summer and fall in Florida. It becomes quite weedy as it ages, but if allowed to grow in a sunny area along a fence line, or in the back of your garden and out of the way of any foot traffic, it will pose less of a problem for you when it goes to seed. 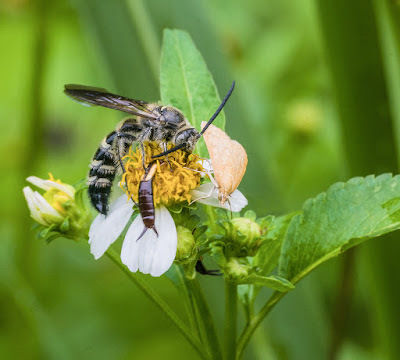 What small discomfort you may feel by the prickly seeds in your shoes and socks, you will be rewarded tenfold by the colorful pollinators that you will attract to your yard. 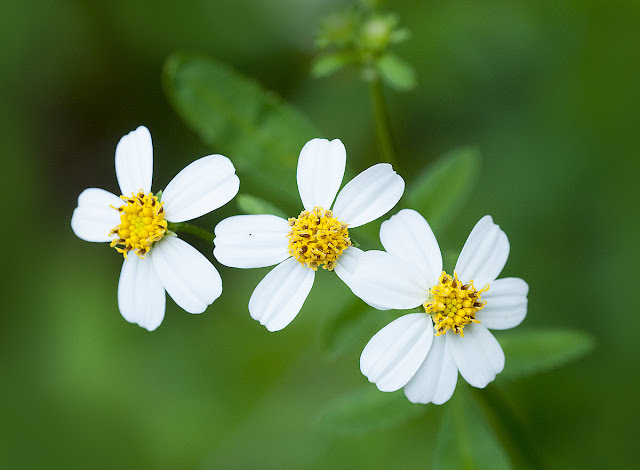 In most Florida climates it Bidens alba blooms nearly year round. They like sun, but will tolerate some shade. They are also very drought tolerant. The plants may die after the first frost, but will come back quickly when the weather turns warm. A single plant can produce 3000-6000 seeds, so if you don’t want them to spread you need to pull up or mow the plants before they go to seed, or, you can eat them…The fresh or dried leaves of Bidens alba are edible. 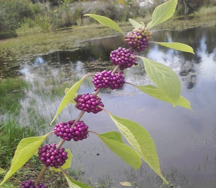 Peggy Sias Lantz, author of Florida’s Guide to Edible Wild Plants, recommends that you pick the youngest leaves and sprouts and “cook them in a few changes of water to get rid of the bitterness.” She also writes that if used sparingly, the leaves and flowers can also be tossed into a raw salad. 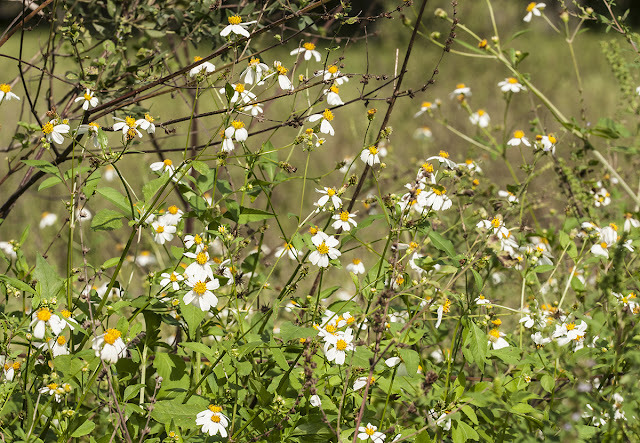 Bidens alba: Weed or wildflower? 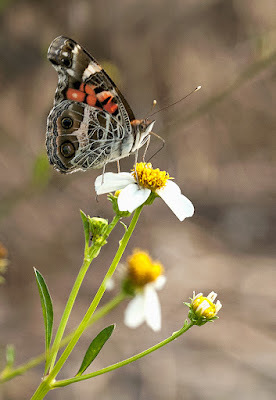 It is all in the eyes of the beholder, and the butterflies. I leave it to bloom in discreet spots in garden because the bees n butterflies are all over it! But when it starts going to seed, it gets pulled! My chickens love to eat them too, they keep the fence line around their yard picked clean of them.